Bernard won the Harp Newcomer Comedy Award in 2000 and performed in the BBC Newcomer Awards the same year. He was chosen to perform in The Montreal Just for Laughs comedy festival in 2005 and also a regular at The Cat Laughs in Kilkenny. 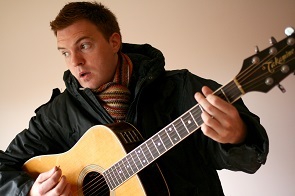 His Edinburgh Fringe debut received a five star review from The Scotsman in 08. He co-wrote TJ and TJ sketches on Today FM and co-hosted the Breakfast with Bernard and Keith Show on the Irish Radio Station i105107. More recently he stars in The Republic of Telly on RTE. To book Bernard O’Shea Comedian or to talk to us about your event requirements, please submit the enquiry form or call us on 087 718 1360.